A complete manual for health and well being through the practice of mind-body medicine techniques. This transformational teaching provides step-by-step meditation instruction, breathing practices, a user’s guide for the mind, a reliable mechanism for accessing intuitive wisdom, common sense Ayurvedic medical principles and a holistic program of easy-gentle yoga. This practical and healing philosophy empowers you to experience unbounded Life, Liberty and Happiness in every circumstance and relationship. THE HEART AND SCIENCE OF YOGA® is both the record of a personal journey and a transformational teaching. It includes easy-to-learn meditation instruction, breathing practices, a user’s guide for the mind, teaching stories from the world’s great spiritual traditions, techniques for gaining intuitive wisdom, an introduction to ancient Ayurvedic health principles, a holistic program of easy-gentle exercise and an extensive glossary and index. 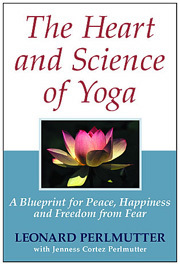 Perlmutter explains that the daily practice of Yoga Science builds a bridge connecting one’s inner wisdom to the outer action that will lead to the greatest good in each moment. Because these are ageless truths, people of every culture and generation have realized the freedom of enlightenment without ever hearing the word “yoga,” or knowing anything about the 5,000-year-old Eastern philosophy. America’s founding fathers, Perlmutter believes, aspired to this universal wisdom during the rebellion of 1776, by basing our nation’s freedom on the recognition of the noble truth that all people are endowed with the unalienable rights of life, liberty and happiness. In 1996 Leonard Perlmutter founded the American Meditation in Averill Park, New York, where he regularly offers classes and retreats. He has served on the faculties of the New England Institute of Ayurvedic Medicine in Boston and the International Himalayan Yoga Teachers Association in Calgary, Canada. He has studied in Rishikesh, India, and is a direct disciple of Swami Rama of the Himalayas. He graduated from American University with degrees in Political Science and International Relations and attended the George Washington University School of Law. He is currently an adjunct professor at the College of St. Rose in Albany, New York, where he teaches yoga and meditation.